When Samsung alienated millions of users by replacing its traditional home button with an on-screen one on the Galaxy S8, the company tried to ease the transition for everyone by making the area around the software home key pressure sensitive. The result? The virtual home key on the Galaxy S8 (and the Galaxy Note 8) feels very much like a real button. You can modify the pressure sensitivity, there’s an option to allow unlocking the phone with a hard press of the software home button, and it’s also enabled at all times. But, it doesn’t look like Samsung will be offering similar functionality on the Galaxy A8 (2018) and Galaxy A8+ (2018), which bring on-screen navigation keys to the company’s mid-range lineup (and a slew of other features). That’s right. The home button on the Galaxy A8 and A8+ isn’t pressure sensitive, which can be confirmed by looking at the user manual for these devices. There’s no mention of the option to hard press the home button anywhere, and the only way of using the home button for waking up the device is by double tapping it when Always On Display (AOD) is enabled. If you’re not a fan of keeping AOD enabled, this means you’ll have to use the power button to wake the device up. 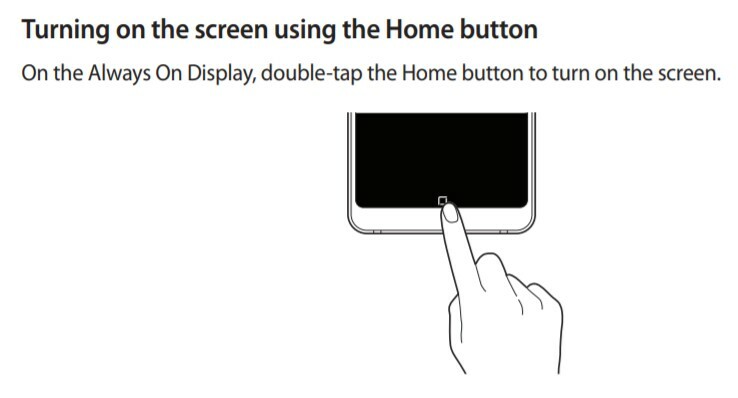 You could also use the fingerprint sensor at the back for directly unlocking and going to the home screen, but the power button would be your only option if you have AOD off and the phone is sitting face up on a surface. Not an ideal solution, and you could say the A8 and A8+ will work like any other Android device with on-screen navigation keys and rear-facing fingerprint sensors. Why is the home button on the A8 and A8+ not pressure sensitive? Well, there’s no way to tell. It could be a cost-saving measure or just a method of separating flagship phones from the mid-range lineup. But it does come off as a disappointing omission, as this means the Infinity Display isn’t accompanied by all of the related functionality that we see on the Galaxy S8 or Galaxy Note 8. For consumers moving from an existing Samsung phone to either of the A8 siblings, this will result in some inconvenience as they get used to not having a physical home button. We guess it’s a good thing Always On Display comes enabled by default and isn’t as much of a battery guzzler on the Korean giant’s mid-range (and budget) phones as it is on the Galaxy S or Galaxy Note flagships. What do you think? Should the A8 and A8+ have come with a pressure sensitive home button, especially with the high price tags they carry? It is a cheaper phone, I wouldn’t expect it to have the same features as a flagship. It’s not really an omission as it’s not a flagship device. Still a very good phone though. Not surprised, and to be honest I prefer the power button to turn on my phone because the press takes longer to register. I have gotten used to pressing the power button to turn my phone on – though I do use the home button too. I do not think this will be a deal breaker for any A fan.